This morning we woke up at the crack of 9:00 because we had to head to Stone Barns for their annual Harvest Fest. It was good because we needed the energy to circle around the grounds multiple times looking for Jen's lost scarf to no avail. 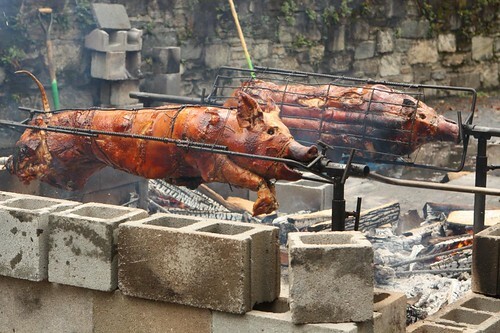 However, we did see two guys turning roast pigs on spits. This made me hopeful that we could somehow convince our landlord to allow us to dig a pit in the front yard and do this for Canadian Thanksgiving this year. Don't expect to see this on the blog in a week's time. After having some Montreal style smoked meat sandwiches at Harvest Fest I decided to make something similar with the leftover Sauerbraten. 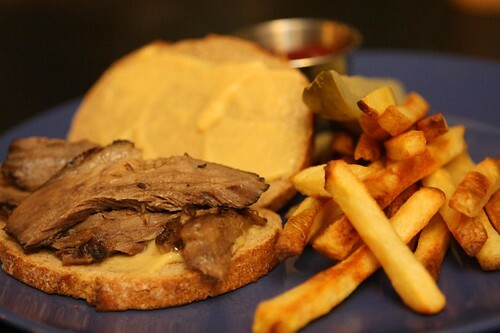 I grilled some slices of rye bread with butter, slathered them with SchoolHouse Kitchen mustard, and served them with some oven fries, and pickle. Jen was highly skeptical of this idea. This was nothing new to me. She was also proven to be wrong in her skepticism after tasting dinner. This was also nothing new. 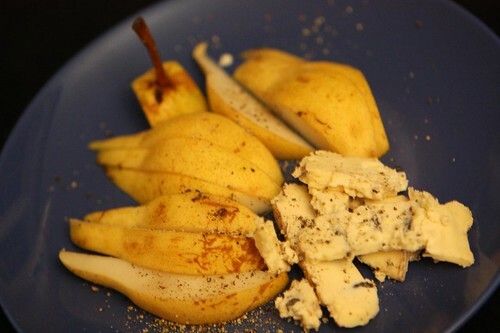 For dessert I sliced up some of the farm Bartlett pears with some Cambozola and cracked black pepper. 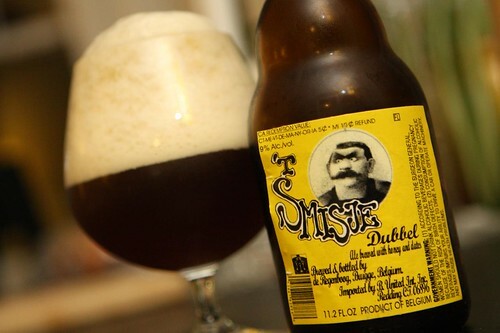 This was the first truly cold night of the season so I cracked open this 't Smisje Dubbel Brouwerij Smisje that Jen got me as a gift. It is a beer brewed with honey and dates and it was fantastic. It had one of the most stubborn heads of any beer I've ever had. I had it after dinner partially because of its flavor and partially because I poured it out twenty minutes in advance and that's how long it took the head to subside. 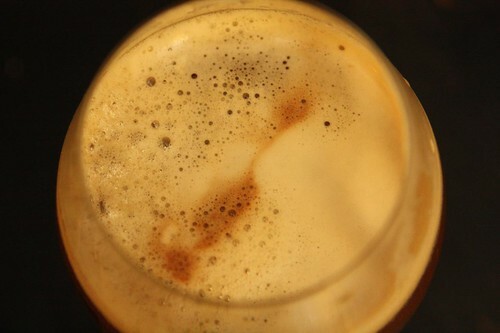 The beer even stood atop the head after pouring a little more in the glass. It was like making a cappuccino. I wanted to make a little picture of a leaf. However, I did not. Instead I slowly enjoyed the beer while being badgered by Jen to look up facts about the age of Aragorn around the time of the Lord of the Rings saga. By the way, he was 88. Mama Mia! That's A-Canadian Risotto!